A couple of weeks ago, we passed along a tweet from Evan Blass that gave the names of all of the variations of the Samsung Galaxy S7 line. According to the serial leaker, Sammy will be producing the Samsung Galaxy S7, Samsung Galaxy S7 Edge, Samsung Galaxy S7 Edge Plus and the Samsung Galaxy S7 Plus. All of those devices should be unveiled on February 21st during the Samsung Unpacked event that is taking place the day before MWC opens in Barcelona. 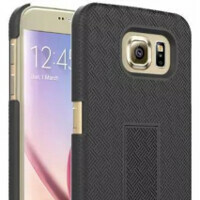 Today, some images have leaked out allegedly showing cases for the Samsung Galaxy S7 and the Samsung Galaxy S7 Plus. The photos show a rectangular home button for the phone. The volume rockers stay on the left side, while the power button remains on the right. Looking at the larger Galaxy S7 Plus, it appears that it could be equipped with a 6-inch screen. Under the hood, the Samsung Galaxy S7 will employ the Exynos 8890 chipset everywhere but the U.S. and China. In those two countries, Samsung will stuff the phone with the Snapdragon 820 chipset. So what will the Galaxy S7 and Galaxy S7 Plus look like in a case? Check it out by clicking on the slideshow below. Anyone here thinks this look uglier than the GS6? Unless it's a transparen, cases always hide the real beauty of phones. Regardless, Samsung is said to mostly maintain the same design language so it can't be that much uglier. Case makers only get the dimensions. This is not how the S7 will look like. The only thing which will be true will be the port cutouts, which is only thing you need for making case. Samsung is not stupid enough to leak the design. The phone may not have a home button at all, or not have a camera hump, or can be made out of full metal or plastic for all we know. I don't even think the design is finalised yet. You are so wrong about this, case makers receive a 3D mockup of the phone. I can't even be bothered to try and explain to you how hard it is to put together a drawing with compound fillets and compound angles. The case makers wouldn't stand a chance of making a case that snugly fits using a 2D drawing. Designers these days design in 3D, then it gets sent straight to CMM and made from the 3D model. Seriously dude. Then you don't know how s6 looks like. Look at the front, camera hump, home button or basically anything. It's an s5 with S6's ports. Of course, we all saw the CAD files in this picture last month. But they're defeatured so that only the necessary info is given out, and placeholders are used where needed like the home button. We already know the aluminum shape will be nearly identical. The screen isn't going to be anything different. The ports are required to make the case fit. So we just don't know if the back will be glass or magnesium or plastic, how much the camera sticks out, if it has a home button, and which USB it has. I doubt there will be any of the big surprises/changes of last year. A 5kmAh battery is what i'm hoping for in the same size, with USBC, and SD card. A sealed battery would be fine if it was that big, and there should be no method to permanently turn the phone off, or radios off, from the lock screen so that the phone is always trackable if stolen. Why haven't they added that yet! Fingers crossed this is the case. Really wanna buy a Galaxy S this time around. Then don't buy it! GLASS = Premium. Apple is appropriate one to whom you should ask that question! Omg...its the same! Only slightly wider and a big-@** camera at the back! Stinks like fake, even if Samsung follows a trend like Apple with their S models I doubt they'd use the same wallpaper as the old phone on renders. Also, look at photo #2, the camera is flat which means the 3d model was poorly made (aka fan made), rookie/lazy-people mistake when adding textures. Only thing I'm worried about is if it is going to cost so much less than previous Galaxy S phones that they cut the quality and features of it because I'm happy to pay any price if the features justify it. So, STOCK IS NOT THE BEST, eh? Touchwiz is? BRAIN FREEZE!!! Any bitching about today's TouchWiz stems purely from the lack of first-hand experience. There is zero lag, stutter, or freezing. Having had the Note 4 and currently the Note 5, neither exhibit any issues at all. This isn't 2012. Ah! Note 4, eh? Have you ever even 'touched' a budget Samsung running Andr... Ahem... Touchwiz like Samsung Galaxy Ace, Core or Star series? No sir, you haven't! Yes, my friend Ace 2 gingerbread very smooth compared my old Xperia M Jelly Bean. With Samsung phones I can have 2 best services I can get. Even I got a chance to win a car if I buy their phone. I have,the Galaxy J7 and it's definitely much smoother than my galaxy S4 on lollipop.This year Samsung really stepped up their game in software optimization.NO lags,slutters or app launch delays and it supports a micro sd card too. Neither is. Somewhere between is best. TouchWiz had lots of great features that stock doesn't. Indeed. Stock Android is empty. Nothing compared to TW's productivity! It is fake. even A series has slimmer bezel than this s**t. and also several rumor indicate that s7 will have minimized camera protrusion. That's going to be one awesome device and I'm a Microsoft 950 xl user. I fully agree. It's going to be a beast. Hope they increase the battery size back up to 2800mah. Things I'm excited about and hope for. Better Camera maybe,keeping OIS. Better battery life. Exceedingly great performance(SD820). 4GB RAM. Hoping for an SD card. If not then a 128gb model still. IR blaster would be great. USB C(USB 3.1 and quick charge 3.0) No overheating or throttling.